Imperial Commander, the 2010 Gold Cup winner, has died of a heart attack in his paddock during his retirement at Mount Top Stud in County Antrim. Nigel Twiston-Davies trained the injury-prone chaser to win eight of his 22 races, earning prize-money in excess of £700,000. Imperial Commander reserved his best for Cheltenham, where he gained six of his eight career wins, starting with a bumper in 2006 on his British debut. He enjoyed his high point in the Gold Cup, when he upstaged the so-called title decider between Denman and Kauto Star, who had won the last three Gold Cups between them. Referring to that, Ian Robinson, who headed the Our Friends In The North ownership syndicate, said on Thursday: "That day at Cheltenham he wrote his own great chapter in his own words when he wasn't part of the narrative of the race. "He was exceptional and took us to places we could never dream of. We just hung onto his tail on the wonderful journey." Robinson was coming to terms with the shock news as Imperial Commander was enjoying an active retirement at the stud, where he had summered during his racing career after being in pre-training there. "It's really sad – 16 is no age and we expected to have him longer," continued Robinson. "He'd been showing in Ireland and we were looking forward to seeing him parade at Punchestown in a few weeks." 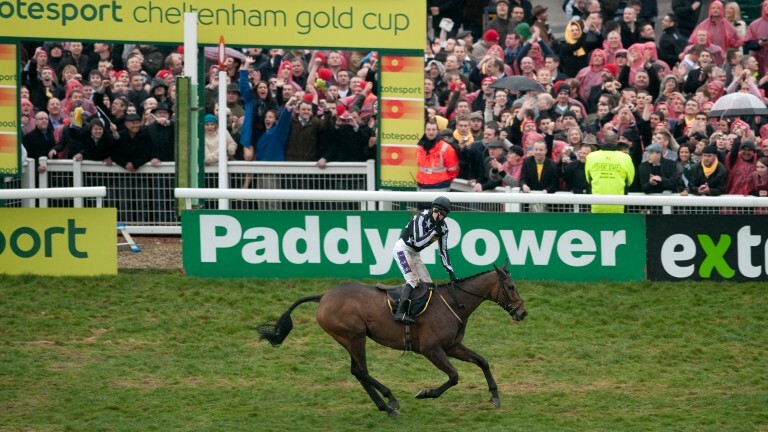 Imperial Commander also won the 2008 Paddy Power Gold Cup, when Paddy Brennan rode him for the first time, and they ended that season winning the Ryanair Chase at the festival. Beaten by Kauto Star in the Betfair Chase and King George, Imperial Commander gained revenge under Brennan in the Gold Cup and then won the Betfair Chase the following season, which was to be his last success. Robinson added: "His partnership with Paddy worked so perfectly, and it was a great team effort at Nigel's throughout his career with Sparky Bevis riding him every day, and Tony Evans was part of his early racing career. "He was never a very sound racehorse and had a hock problem throughout his career, but at his best he was something special. I'll never see the like of him again. "He was a bit like me – not very good in the morning but loved Cheltenham."